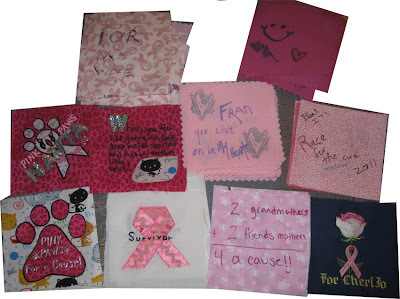 I've started on the first breast cancer quilt for this years Quilting for a Cure. I like to take the time and look and read each block received for each quilt I have volunteered to complete. Here are a few of my favorite blocks from the first quilt bunch. 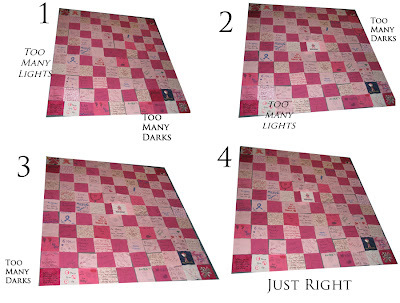 This quilt had 110 5" blocks. Therefore, I'll have a 10 block columns by a 11 block rows quilt. I also have the Ford block for the center of the quilt. I have not decided on whether there will be borders or not as of yet. After I received each block, I place them in color categories and count them up. I try to randomize them as much as possible. By this, I mean I try to separate the similar colors. This bunch had one blue block. It's a beautiful embroidered block. I know that anywhere I place this block, it will stand out. Below is a montage of the layouts. I love using the camera to help me see the color values and it allows me to see where there a too many light like blocks and too many like dark blocks. This layout only took me about 4 tries. There is an imbalance of dark stripes on the lower left versus the top right but I think it still works. On the final (4) bottom left there seem to be 4 dark diagonal stripes and on the top right there are only 3, but I like it. What do you think? That's it for today, maybe tomorrow I'll start sewing them together.